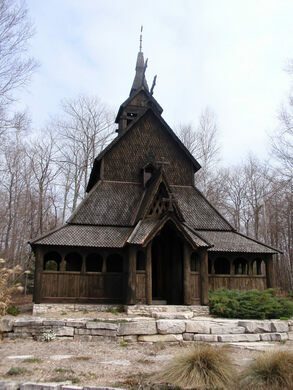 Seemingly dropped in place right from medieval Norway, the traditional wooden stave church belonging to Wisconsin’s Trinity Evangelical Lutheran Church was built on Washington Island to honor the area’s Scandinavian heritage. Expansive and colorful studio of Minneapolis art-star, Doug Padilla. Stave churches, or “stavkirkes” in the native Scandinavian, were common throughout the mother country in the middle ages but most have been destroyed by fire, rot, and the ravages of time due to their vulnerable wooden construction. The multi-gabled churches got their name from the multitude of load bearing posts that supported the structures, which while they ministered to Christian faithful, still bore a strong pagan viking design sense. While only a comparatively small amount of the once ubiquitous houses of worship remain, their traditions are kept alive by replicas such as the one on Washington Island. The foundation for the Trinity Evangelical Lutheran Church’s stave church (modeled after a church in Borgun, Norway) was built in 1991 and completed three years later. The wooden church is mainly used for ceremonial purposes such as weddings, while the main church building which holds the regular mass is located across the street. 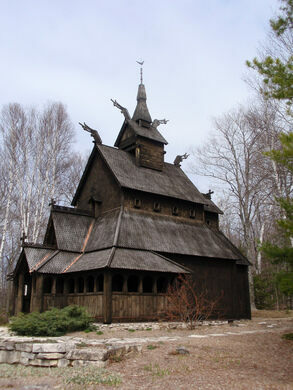 The stave church is only open seasonally, but the convincing air of Norwegian history permeates year-round. World's largest pet casket company brings in up to $5 million per year in revenue.